THE B-MOVIE NEWS VAULT: STOCK YOUR VAULT: New DVDs & Blu-rays for 11/21/2017! STOCK YOUR VAULT: New DVDs & Blu-rays for 11/21/2017! Greetings Vault Dwellers! Turkey Day is tomorrow (and that means it's time for MST3K's annual Turkey Day marathon), so before you go out hunting for some Black Friday deals after dinner, I best tell you about the new DVDs & Blu-rays that are out there in the wild for you to find! This week is very light on new releases, but as always, there's some cool titles if you take the time to look. Shout! Factory gives us their (quite possibly) final volume of their wonderful Mystery Science Theater 3000 boxed sets! 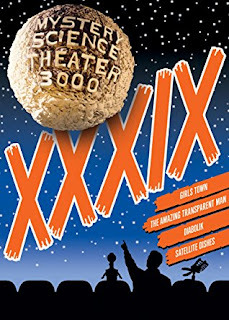 This one contains GIRLS TOWN, THE AMAZING TRANSPARENT MAN, DIABOLIK, and "Satellite Dishes," a disc that contains all of the host segments from the dozen or so episodes we may never get to own on DVD! Criterion just released Terry Gilliam's JABBERWOCKY, Warner Archive Collection has gave DOLORES CLAIBORNE its Blu-ray debut, the odd (but fun) DAVE MADE A MAZE is now available on DVD & Blu-ray, and THE MAN FROM EARTH received an extras-packed Special Edition Blu-ray release! 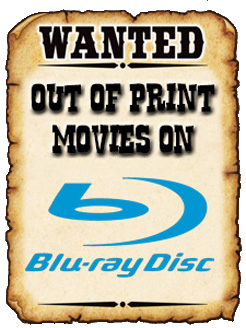 There's not much else to brag about this week, so scroll on down to see the full roster of new DVDs & Blu-ray discs! And also be sure to have a great (and safe!) Thanksgiving with your family and/or friends tomorrow gang!